You can send me a design to show testimonial for your site which you want to use and We will make it available on next release for you! 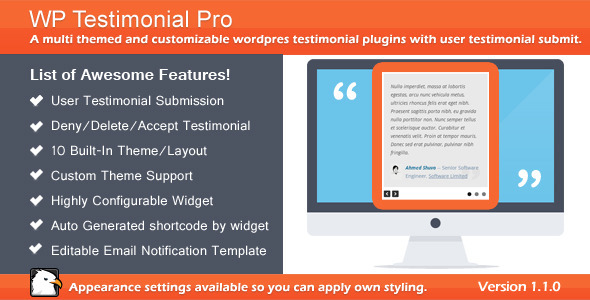 Version 1.1.0 – 04 Dec, 2013 + Core Updated + Fixed Global Post Thumbnail size issue + Admin CSS Updated + Widgets Updated + Auto generated shortcode by widgets for page/post use to display testimonial. + User Testimonial Submission - CSS Fix + General Settings additional settigns added to support Testimonial add interface fields and label display and modification control + Appearance settings added to adjust testimonial design with Background, Color styling + Default Widget Settings Added 10 Documentation Updated Version 1.0.0 – 25 Oct, 2013 + Initial Release!